This is a series of articles, which I hope will be of interest and enjoyment to members. I have decided to concentrate principally on windmills, since I have less of a "feel" for watermills and am consequently less able to write about them with enthusiasm or authority. My main source of information has been the HES Simmons Collection in the Science Museum library, although I have tried to make use of as many others as possible. I am aware that Simmons needs to be treated with caution as a contains a number of inaccuracies, but have done my best to spot these and eliminate them. If any should have been missed and consequently reproduced in the articles I offer my apologies. It should be assumed, unless indicated otherwise, that all other information is derived from the Simmons Collection. The same will apply to future articles in this series. This impressive tower mill, one of the largest ever built in Sussex, was for many years a familiar feature of the Littlehampton coastline. It derived its name from its position close to the mouth of the River Arun. The mill was built in 1831 by Henry Martin of Bognor, millwright, on land leased to him for the purpose by the Duke of Norfolk. In the following year Martin sold the completed mill for £726 to William Halsted Boniface, who later added a dwelling house, storehouse, two cottages and various other buildings to the property. In March 1836 Boniface granted a 21 year lease to Robert Canter of Lewes. On 10 January 1840 the lease was transferred John Woodhams Jnr. in whose family the mill was to remain for over 60 years. Boniface died in November 1849 the mill was heavily mortgaged, and was disposed of by his executors to the mortgagee, Charles Newman. Woodhams remained as tenant miller. On Newman's own death, which occurred in 1853, the mill and property were sold by auction to Thomas Crunden. At the expiration of the lease originally granted to Robert Canter, Woodhams bought the property. He died in August 1879 but the business was carried on by his sons until 1901. From then until 1904 the miller was Percy Sherrell, who was followed by CA. Bailey. Bailey worked there for only a year before being succeeded by Norman Ashby. Ashby left in 1910, after which the last to use Arun Mill were William Cook & Sons, until 1913. The remaining lease of the property was taken over by Miss Leila Streeter from whom permission to inspect the mill could for a while be obtained for a small fee. After the lease expired in 1930, it was hoped that the by then derelict mill would find a purchaser who would ensure its survival. Certainly, the enlightened would have appreciated the asset a restored windmill could be to a seaside resort, especially if opened to the public. But in the last resort (no pun intended) taste was spurned in favour of a cheap vulgarity. In December 1932 the mill was pulled down and its site became an amusement arcade and funfair. Its loss was one of the most regrettable in the history of Sussex windmill preservation. The mill spent the last few months of its life ignominiously festooned with hundreds of coloured lights as a tourist attraction, in a symbolic desecration of the old by the brash and tawdry new. Arun Mill was built of stone faced with cement and had four floors, with a stage at the level of the second braced to the tower by diagonal timbers. The cap was of the kind found on many smock and tower mills in the Arundel/Chichester area, a dome with the material used to proof the corners of the boards where they meet being particularly noticeable. Thus it had a polygonal appearance, and a number of vertical boards extending part of the way along the fantail sheers. Another good example of this form of cap could be seen until fairly recently (i.e. 1978-9) on Eamley smock mill. Also characteristic of this part of Sussex were the low arched window openings.1 Littlehampton also had a skirt of vertical boards at the base of the cap, a feature not present at Eamley. The four patent sails came from Climping mill when that ceased work in 1900. They replaced a set of the same type but with wide leading boards which the new ones did not possess. As built the mill had only two pairs of stones, but by 1840 a third has been added as the notice for an attempted sale tells us. The notice also mentions a flour machine and smutter, and to emphasise the power of the mill states that these and the stones could all be driven at the same time. About the mill's interior we have no further details, except that the wooden upright shaft, fitted to replace an earlier one during renovations c.1870 was once part of the mast of a yacht belonging to the above-mentioned Duke of Norfolk. Finally it may be added that Henry Martin also built the fine mill at Bamham, which has been luckier than Littlehampton and is currently being restored. 1. Photograph in the National Monuments Record, Royal Commission on Historic Monuments, London. Barcombe mill was erected in 1817-18 by millwright Jesse Pumphery, who worked it until 1825 when he left to live in Lewes. Following his departure the mill was owned by John Holroyd and tenanted by Richard Jenner (1). Holroyd advertised the estate for sale in 1835, 1836 (twice) and 1837. Jenner was still tenant in the latter year, but by 1839 had been succeeded by Henry Guy Jnr. In 1848, when the property was put up for sale again by court order following the death of Holroyd, the mill was being let jointly to Guy and a Mr Good. At some point Good seems to have left and in 1851 Miss M Guy is given as miller, with Henry Guy being listed again in 1855. Guy was followed by Henry Gaston. Later the property was acquired by a Mrs Hemsley and by 1882 her miller was John Locke, who remained at the mill until it ceased work in 1890. In 1891 the mill and the ground on which it stood was sold by Mrs Hemsley to Mr E W Bunney, a well-known local flower grower. Mr Bunney intended to pull down the mill but the millwrights wanted £30 for the job, and also requested that he supply all the necessary materials. He considered this proposal unreasonable, and so the mill remained standing, the roundhouse being utilised at one stage as a chicken house, until burnt down in 1907 or 8. The cause of the fire, which appears to have started in the upper part of the mill, is a mystery. A gale was blowing at the time and pieces of burning timber were carried quite a distance by the wind. Many of the timbers and machinery were saved and afterwards sold quite profitably by Mr Bunney. In the 1930s the mill house still stood with one of the millstones in use as a step. The bakehouse, which adjoined the miller’s cottage, had been converted to a garage. The mill was a large white one with a single-storey wooden roundhouse. It was reputed to have been very solidly constructed and thus very heavy; owing to the consequent difficulty experienced in turning it by hand a horse was employed for the purpose, a concrete track being laid around the mill for it to walk on. It is also said that the sweeps were exceptionally large. There were two pairs of stones. A photograph of the mill in 1905, without sweeps and tailpole but otherwise in good condition, appears in Sussex Industrial History Issue 17. (1) Sussex Industrial History Issue 17, which contains an article by Martin Brunnarius on Jesse Pumphery and the work he did at Barcombe mill and others. The first evidence of a windmill at Bolney comes from the parish register, which records the burial on 2 December 1743 of John Davy, "killed accidentally by the windmill". We cannot say whether the mill was one of those mentioned below. Later one is shown on Cream's map of 1795, about half a mile north of the church, and another is said to have existed on the south side of the road between the Fox and Hounds and a place called Long Wood, on land still known well into the twentieth century as Millfields. Of principal interest to us though will be the smock mill which stood to the north-east of the church, opposite the Queen's Head public house. This is first shown on Faden's map of 1795, although it is described in a sale notice four years later as "newly built" (the claims made in these documents are often exaggerated). It may have been the mill put up for sale in 1778 along with a house and half an acre of ground, but so could Cream's. Certainly H.E.S. Simmons could find no evidence of its existence before then. A timber inside the mill on which was painted "T F 1828" probably came from elsewhere, unless the date commem­orates repairs. The mill is next mentioned in the Defence Schedules of 1801. Schedule 1 records it as being capable of supplying 1 sack of flour every 24 hours, but in Schedule 2 the amount has risen to 20 sacks - surely an error as such a huge increase in output does not seem likely! The miller at the time was John Barber, who in 1813 disposed of it along with a newly erected watermill to William Packham. Packham in turn sold it to John Bennett, in 1818. The following years were bad times for millers, due to a slump in the rural economy, and by 1825 Bennett was bankrupt. The next two incumbents, Robert Brazier Rice and Thomas Terry, were both short-lived, meeting the same fate. Then things seem to have stabilised, with Henry Leppard at the mill from 1839 to 1859. Later millers were H. Payne (1866), Thomas Ashby (1870, 1874), Messrs. Packham and Comber (1876, 1882), John Packham (1887), and finally a man named Pierce. The mill was purchased c.1878-80 by a prominent local dignitary, Edward Huth JP of Wykehurst Park. According to him it was by then out of use, but this of course conflicts with the evidence of the directories, besides which remarks made by a local inhabitant to Gurney Wilson imply that it stopped in 1891 or 2 when one of the sweeps broke off. Huth carried out no maintenance to the mill, as he preferred it in an ancient and dilapidated state and thought restoration would spoil its romance! The remaining sweeps were removed in 1905, and at the same time the millstones were taken out and placed on either side of a new lych gate at the church. Latterly the derelict mill saw service as a coal merchant's store and a chicken run. It was finally demolished in 1916, having been condemned as unsafe. 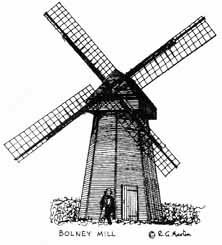 Bolney mill was a small one, about 36 feet high, with two pairs of stones. The cap roof was straight-pitched, with the boarding carried down vertically to form a skirt around the top of the tower.1 The mill was of particular interest in that it seems to have been virtually untouched for the whole of its working life. Few other Sussex tower or smock mills - if any -remained so primitive in character until the end. It was one of the last in the county to be winded by hand, the others being Hammond's Mill, Billingshurst and Black Mill, Bognor.2 The sweeps were commons, and most of the machinery was of wood apart from the iron windshaft. Not only the machinery but the whole of the structure was wooden; there was no brickwork in it apart from the foundations.3 Only one other Sussex smock mill, at Guestling, is known to have exhibited this feature.4 It is not necessarily a sign of age, being found on mills dating from well into the nineteenth century, but is comparatively rare and associated mainly with eastern Kent. The date of this mill's construction is unknown to me. In 1794 it was owned and worked by a Mr Woodhams, who decided to sell it but later changed his mind, putting a notice to that effect in the Sussex Weekly Advertiser. He then changed it again, and a further notice appeared in the paper on 22nd December assuring readers that the sale would definitely take place: "Mr Woodhams had not entirely made up his mind on the subject of quitting the mill, when he thought it proper to stay the sale before advertised." The cause of the sale was his decision to "go into another line of business." (1) Photocopy kindly supplied by the late Frank Gregory of a photograph in his possession. The first indication of this mill's existence is its appearance on a map of 1780. In 1792 the miller was Thomas Heather. By 1796 he had been replaced by Edward Penfold, who upon his death in 1837 was described in an obituary in the Brighton Gazette as "one of those primitive, unaspiring and true old English hearted yeomen, of whom we regret to say so few are left." In 1818, when it was put up for sale, the mill was part of the manor and estate of Offington, and was occupied by William Patching. Who bought it is not known but two years later, in 1818, it was in the occupation of Mr S Stubbs. In 1823 the tenant was Mark Markwick. The mill was for sale again in 1837. A directory for the years 1841-2 gives Edward Isden as miller in addition to Charles Ballard. At a date which has been given by one source as 1859 and by another as 1870, the estate including the farm and mill was acquired by Captain T. F. Wisden of the Warren. By 1890 Charles Ballard had given up the mill, devoting himself to his hobby of collecting flint implements on the Downs. His son Richard then took R over, and was there in 1890 and 1895. As with a good many other Sussex windmills, the "miller" was essentially a foreman, the actual task of grinding being performed by another person; the last regular grinder was Henry Isted, who left in 1901 to go to a mill at Forest Green in Surrey. Isted, who succeeded a man named Hyland, was at Broadwater for 19 years. The mill, which was run for a short time after Isden left by the owner of High Salvington Mill, who employed one miller for both windmills, is said to have ceased work in 1910. However its condition when demolished for safety reasons early in the First World War indicates K had been out of use for longer than the four or five years this would suggest. Although the sails were still on, the body was in a near-skeleton condition with most of the weatherboarding gone. Perhaps vandalism, or gale damage, or both, played a part in its rapid deterioration. The mill house was itself pulled down in 1937. Broadwater was a black mill with a single-storey flint roundhouse. It had two common and two spring sails working two pairs of stones. This post Mill stood off Mill Road on St John's Common, not far from Wivelsfield station. Although it has been thought of as belonging to Burgess Hill, the site was actually in Keymer parish. It was built by a P. Dove in 1769, according to an inscription carved on the post (others to be found there were '"C.P. 1806", "W. Harding 29. 5. 1860" and "S. Upton 1871"; what connection these persons had with the mill is unclear). The first documentary proof of its existence is the Defence Schedules of 1801, in which the miller is given as John Eager. The mill was capable of producing four sacks of flour daily, provided wheat was supplied for the purpose. In 1811 it was owned by William Tobutt, who put it up for sale in that year. It was sold again in 1815, 1816 and 1822; on the last occasion it was in the occupation of Mr. P. Woolven. Millers we know of include John Gainsford (1834), J.W. Mercer (1845), and Charles Avery (1858). The mill ceased work c.1885-90, the last man to work it being a Mr. Wood. (1) Photograph in Brighton Reference Library, captioned "Wivelsfield"
This mill stood on Holbans Farm south of the road from Heathfield to Burwash, just east of the boundary between the two parishes. It was said to have been the last post mill built in Sussex, and to have owed its construction to a desire for a mill at which stolen corn could be ground. One account states that it was built by Stephen Nave in c.1860 at his millwrighting premises at Rushlake Green and transported to Rockhill in sections (this according to a member of the Nave family). However it appears to have been standing in 1839 when John Hayward paid 11s 10½d "for a windmill below Morris' Town". The rateable value of this was £6 and he was owner and occupier. Hayward was killed whilst visiting Cross-in-Hand Fair on 19th November 1842 - the report of his death in the Sussex Advertiser on the 22nd does not say how. The actual miller in this year was John Allcorn according the Tithe Map Schedule. Shortly after this, the mill was put on the market. The sale notice stated that the mill "has been built only about 5 years", suggesting a date of c.1838 for its erection. Allcorn is given as tenant in 1844 and 1847. H.E.S.Simmons' notes imply that Hayward was erroneously listed as owner in the ratebook of the previous year; in the books of 1845, 1846 and 1847 the words "the proprietors" under the column headed 'owner". The books for 1845 and 1846 both give William Allcorn as occupier. In 1849 John Fielder is listed as owner with Thomas Ellis junior as tenant. The property is described as two houses, mill and land at Morris Town £35-5-0. Ellis was at the mill in 1851, 1855 and 1858. He lost his life in an accident at another mill in May 1861 after which his widow carried on the business for a short time before putting the mill up for sale in 1863. It was purchased by David Collins, founder of the firm of millwrights of that name. A directory of 1870 gives the name Alfred Gearing along with that of Collins. It was for sale again in 1873 and appears to have been bought by John Richardson, who used it in conjunction with a mill at Burwash. Richardson was at Rockhill in 1878, 1882 and 1887. His presence there in the latter year indicates that yet another sale on 1883 was unsuccessful. However by 1890 the mill had passed to the Dallaway family, subsequent directories giving variously John Dallaway, Dallaway Brothers or John Dalaway and Sons as miller(s). John Dallaway at some point built a steam mill near the windmill, after which the latter was rarely used. I am not clear as to the date when the mill finally stopped working. It was probably disused by 1915 when the farm was being run by a Women's Co-operative with a Miss A. K. Emerson as managing director. In 1922 one pair of stones was removed and installed in Barcombe Watermill. By the mid 1930's the sails and much of the machinery were missing leaving the mill little more than an empty shell and the structure in very poor condition. The windshaft remained in place. The iron sheeting covering the roof, breast and sides of the mill may have helped to prolong its life to some extent. It was standing in July 1939 but by the autumn of 1940 it had been reduced to a heap of wreckage, having collapsed after being weakened by German bombing earlier in the year (1). 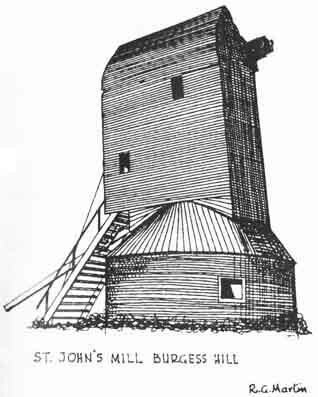 The mill was a white one with a vertically boarded wooden roundhouse, and as noted above, the roof, breast and sides were encased in iron sheeting. It had four spring sweeps with leading boards and drove two pairs of stones. The fantail had been fitted to the tailpole by 1843 when it is mentioned in the sale notice but in the long run it proved to be troublesome and inefficient and was removed. Another noticeable feature, shared with Somerhill Mill at Warbleton, was the small mushroom shaped brick piers on which the wooden roundhouse rested. (1) Photographs in the National Monuments Records, Royal Commission on Historic Monuments, Swindon; note in Paul Davis Collection, University of Kent Library. The old post mill at Baileys Farm, Coolham is believed to have stood originally at Kirdford, where it was erected between 1770 and 1780 and been moved to Coolham around 1800. According to the Defence Schedule of 1801 it and the local watermill, which were run in conjunction, could supply between them 20 sacks of flour in 24 hours. The first miller that we know of is Sarah Killick, who was there in 1847. A Henry Killick was using the mill in 1855, 1858 and 1862. Possibly the Killick family had been working it for many years before him, as their ancestors had erected the watermill in c 1780. In 1866 an E. Joyes was at the mill and from 1870 to 1887 James Thorpe was there. John Alfred Hams is recorded in 1890. The last man to use the mill was Henry Naldret, during whose time one of the sweeps blew off, the opposite sweep then being taken down. In 1898 the other pair of sweeps was also removed, and the mill ceased operation. It survived until 1915 when it was pulled down by carpenters from the Burrell estate, to which the property belonged, and the main timbers used in the construction of furniture for the Knepp Castle estate offices. In the 1930s various other parts could still be seen lying about the farm, and one millstone was embedded in the ground at the entrance to the mill house. The mill body had a steeply-pitched roof - a feature which this writer at any rate associates with relatively old post mills as did the brick roundhouse. Michael Yates notes that the boards at the bottom front of the breast are heavily angled downwards and there appears to be an upward extension of the roundhouse roof. 1 Latterly the mill worked with two common and two spring sweeps, mounted on an iron windshaft which would have replaced an earlier wooden one. There were two pairs of stones. A sale notice of 1782 describes the Beacon Mill as newly built. It was then in the possession of Thomas Hoadley, upon whose bankruptcy in 1785 it was acquired by Charles Hoather of Malling Mill, Lewes. Hoather later sold it to Mr J Moon. During the latter's ownership, on the morning of 3rd March 1793, the mill was struck by lightning and set on fire, but the blaze was extinguished in time to save the greater part of the structure. In 1839 the mill was owned by Farah Ashby and tenanted by Reuben Ashby, presumably a relative. Samuel Wickens was miller in 1845. The mill remained in the Ashby family until 1861 when Thomas Ashby, who was also connected with Fletching watermill, sold it to Richard Pratt. Pratt shortly afterwards bought Crowborough tower mill, which remained in the family for many years and which survives today without cap or sails and with the tower reduced in height and converted to a house. The post mill passed from Richard to his brother Samuel, who worked it from at least 1874 until about 1890, when the stocks broke and the sails were subsequently removed. After the mill closed down a square turret was built on the roof, forming a look-out from which a marvellous view of the surrounding countryside could be had. To this were added at some point a brazier and a flagpole. The owner of the mill said he did this because he had grown tired of being asked by visitors to Crowborough where the Beacon was; he could point to the mill, and they would go away satisfied. These features rather spoilt the structure's appearance, as did the four white wooden crosses nailed to its sides. Although aesthetically marred, the mill appears structurally to have remained in good condition for many years. At some point between 1940 and 1944 it was burnt down (one trusts nobody had actually tried to light a fire in the brazier!) The charred main post and trestle still stood in the late 1960s; the lower portion of the former, along with the pintle, was later taken to Argos Hill mill. Beacon mill had one of the largest post mill bodies in Sussex. It was tarred black with a metalled roof and breast and a single storey vertically-boarded wooden roundhouse. The post stood in an immense cast-iron shoe which rested on brick or stone foundations, and the spout floor was supported by the trestle. The sweeps, said to have been springs, were mounted on a round wooden windshaft. Wooden brake and tail wheels drove two pairs of stones, both 4 feet in diameter and each with its own governor. Auxiliary machinery consisted of a flour machine and a smutter. The sack hoist is said by Mr R Hawksley to have been of an unusual type. The tar with which the mill was heavily coated would have assisted in prolonging its life, but also aided its eventual destruction by fire. This post mill was built in 1824 to replace one destroyed by fire. Shortly after its construction it was sold to George Holman, son of Samuel Holman the original owner. He disposed of it in 1831 to James Martin, who in turn sold it in 1841 to a Mr E Morris of Lewes. Subsequent millers included G Norman (1851), Stephen Douse or Doust (1855, 1870), David Mercer (from 1872 to 1878), Caleb Woodham formerly of North Street Mill, Hellingly) (1882), Lewis Hampton (1887) George Davis (1890). In 1836 the mill was severely damaged in what the Sussex Advertiser described as a 'Tremendous And Destructive Hurricane'. In December 1891 it suffered the same fate as its predecessor. No apparent cause for the fire, which destroyed the structure within two and a half hours, could be ascertained. At the time the mill was in use and in good condition; it is believed to have been insured. The blaze was said locally to have been started deliberately. This was a handsome-looking white mill with a roundhouse, fantail and four patent sweeps, the latter having leading boards extending their whole length. Black Mill, a post mill, was first recorded in 1760 when it was owned by Mary Neeves of Pagham and occupied by Thomas Pratt. Pratt appears to have vacated it by 1762, when it was sold to James Sayers of West Chiltington, who disposed of it the following year. It was again for sale in 1773. By 1830 the owner was a Mr Hardwick of Bognor. In that year the tenant miller, Covens, died and was succeeded by Joey Lager. 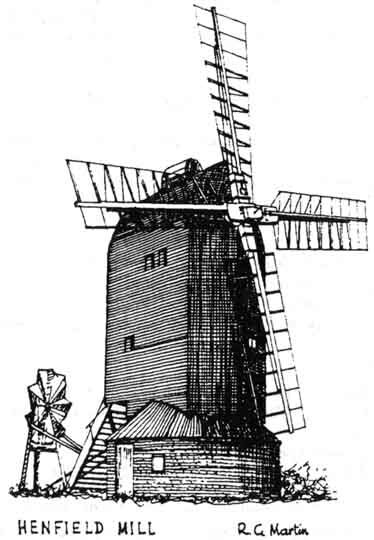 The mill was on the market in 1841; the sale notice in the Brighton Herald describes it as having patent sweeps and two pairs of stones. As far as the sweeps are concerned the notice would appear to be incorrect; a photograph which must surely have been taken after the date in question, since photography had barely begun then, shows the mill with four commons 1, and although two of the sweeps were replaced with springs or patents at a later date it is not likely the mill would have reverted from four patents to four commons. The property, which also consisted of two cottages, a two-stall stable, and two piggeries, was stated to have been lately put into repair. Who bought the mill is not known. Laker was still there in 1841-2 but the Tithe Apportionment of 1844 gives Henry Hobbs and another person as the occupier. Thomas Reynolds was the miller by 1882 but had been succeeded by Henry Reynolds by 1887. At or shortly after the latter date the mill ceased work due to the building in the vicinity, of new houses which 'had robbed it of its wind.' In about 1894 the sweeps were removed in order to reduce the rates for the property. It is not likely that the building would ever be used again as a windmill and it was getting into a dangerous condition. The owner Mr Sparshott narrowly escaped injury on one occasion when he chanced to be inside it, the floor of the upper storey and collapsed beneath him; so in due course it was decided to demolish it. As it was an important seamark permission for its removal had to be sought from the Admiralty, which prolonged its life by a couple of years. The demolition was carried out in December 1902, the body being dismantled by Thomas Richardson and Levi Witchef and the roundhouse by Mr Sparshott himself, assisted by his son. As its name suggests the mill was 'tarred black'. The breast beam projected forward of the front of the mill, a feature which marks it out as being of early or mid-eighteenth century vintage (Felpham is the only example of this which I have so far come across in Sussex). 2 There was a "cartwheel" on the end of the tail pole to assist in winding. The photograph shows that at some point two of the four common sails were replaced by shuttered ones. The sides of the body appear to be clad in metal sheeting.3 The roundhouse was a two-storey brick affair, the lower storey being a cellar. For some reason prior to 1839 and up to at least 1845 Henry Hobbs was the miller. An R.L.Boniface is named in directories of 1851 and 1855. The mill was advertised to be let in 1876 and was presumably taken on by Charles Digweed, for he was running it in 1878. The mill is said at one time to have been owned and worked by Henry Feaver. The last owner was a Mr Stubbington. The mill ceased work and was dismantled, in 1879 due to encroachment on the site by the sea, which now obscures all traces of the building (although in the 1930s the foundations were said to be occasionally visible at low tide). White Mill appears to have been one of the largest smock mills, perhaps the largest ever built in Sussex. It stood on a substantial battered two storey base with a stage, above which the smock tower tapered sharply. It had a typical West Sussex domed cap with horizontal weatherboarding carried down to form the petticoat over the curb, four single-shuttered patent sails, and a fantail whose sheers were boarded over and beneath which was the striking wheel for the sails. 4. 1 Photo in Bognor Regis College (West Sussex Institute of Higher Education, hereafter BRC ). On the back of this is a note alleging that the mill was built by William Cosens, presumably of the same family as the tenant miller of 1830, in 1803. I am inclined to dispute this in view of all the other evidence pointing to the mill's being considerably older, although it is quite possible that substantial repairs were carried out in that year. This mill is originally situated at Glynde, near Lewes, where it is erected in 1807. It is dismantled and moved to Blackboys in 1867 or 1868 by Henry Garnett for Mr Hobden of Sapperton Farm, Heathfield, who had bought it some time prior to the removal for his son Luther John Hobden. Hobden is running the mill in 1874, but in September the following year it is advertised to be let or sold. It remained within the Hobden family, Mrs E. Hobden being given as miller in 1878 while Luther John Hobden is listed again in 1887 and 1890, although in a notice in the Sussex Advertiser in 1888 he had stated that he is giving up the business and "suing William Farrant and others for flour supplied" (that is, trying to recover debts in connection with the same;(1) ). Mrs R. Hobden is miller in 1895. The Paris family took on the mill in 1896 and were to work it for the remainder of its active life. Among the grinders employed were Solomon Diplock and George Tree. From them it passed to a firm called Stricklands in 1934. In common with many others, the mill ceased to produce flour during the First World War. It continued to work commercially milling animal feed, and in fact is one of the last windmills to do so in Sussex. It finally ceased operation on 1st March 1935, the sweep frames being removed three days later by Neves of Heathfield. The Society For The Protection Of Ancient Buildings sought to keep it functioning and in January 1936 instructed the millwright Thomas Hunt of Soham in Cambridgeshire, to contract for repairs, but these proved to be too expensive and no work is undertaken. The mill is demolished in late 1944 or early 1945 as it is considered unsafe and a danger to children who played inside. In fact, although it had been sadly mutilated during the war by soldiers who ripped off much of the boarding for use in camouflaging their tanks, the main timbers were fairly sound. The foundations of the brick piers supporting the trestle were still evident in 1978 [Ed- but not in 1999]. The mill is a small one, painted white with a metalled roof and breast and a tarred single storey wooden roundhouse. As at many other Sussex post mills the metalling is added quite late in the mill's active life, several photographs showing it without it (3). It ended its working days with four spring sweeps, after working for a time with two springs and two commons. On an iron windshaft were mounted a wooden brake wheel and an 8-spoke iron tailwheel in two sections. There were two pairs of stones, one peak and one burr up to about 1915 when the burrs were replaced with peaks on cessation of flour production. A photograph of the interior in the National Monuments Record at Swindon shows a pair of wire machines. (1) Michael Yates, in a letter to the author in 1998. (3) "Around Heathfield in Old Photographs" Alan Gillet and Barry K Russell, Alan Sutton 1990. Hill, the millwrights of Ashford, Kent, built this smock mill In 1859 for William Crisford. It was a comparatively late addition to the ranks of Sussex windmills. Crisford owned It until around 1830, the mill being up for sale In June 1881 when occupied by Peter Dulvey Stonham, who was responsible for all repairs. Stonharn's tenancy was to end at Christmas 1883. The property was still for sale, or was being resold, In 1882. A bakehouse had by then been added to It. By 1887 Caleb Jenner, whose family was to operate the mill for the rest of Its active life, was In possession. A WiIIiam Caleb Jenner ran It from at least 1895 until 1915 when Gordon Caleb Jenner took over. Shortly afterwards the miller, a Mr Weston, died and his successor soon departed for the war. The wartime conditions made It difficult to find a suitable replacement, and for most of the time the mill stood Idle, with the result It was partly tall-winded, one man nearly losing his life In the attempt to avert further damage. Gordon Caleb Jenner now decided that It should be demolished. For the most part the structure was In perfect condition and for this reason Its demise was seen by some as most regrettable, one miller friend of H.E.F. Simmons going so far as to call It a crime. The mill was a white one, large and roomy with five floors and able to accommodate four pairs of stones, two of which were overdrift while the others were underdrift and capable of being disconnected and driven Independently by a steam engine. 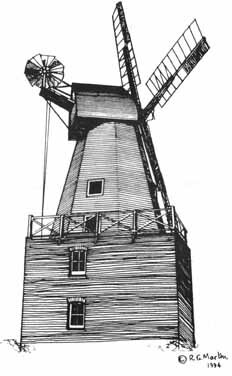 Unusually for a smock mill of Its size It stood on only one foot of brickwork. The sails were double-shuttered patents and the Kentish-type cap was winded by an eight-bladed fantail. The mill was considered to be one of the finest In the area. It was known by a variety of names during Its life, apart from the usual one [stated In the heading]. Originally called simply Guestling Mill, It later become Down Mill, after nearby Down Farm, and then FairlIght Mill after the mill at that place had been burnt down. This post mill stood within the village of Heathfield on the main road from there to Burwash, to the southwest of a crossroads. "Fire on the morning of 11th inst. The wind flour mill known as Broad Oak Mill, belonging to Mr W Boumer, was burnt to the ground with nearly all its contents. It was first discovered by Mr G. Gardner Jnr. of Milkhouse Toll, about a quarter past two on Tuesday morning, who was about seeing to some lambs, he being about a mile from the mill, went to Mr Bourner's, called them up, and then with Mr J. Dunk, baker to Mr Boumer, ran to the mill, burst the roundhouse door open, and brought out a goodly number of sacks of corn. They were soon joined by others of the surrounding neighbours, who worked willingly as long as they were able, the mill all the time being in a blaze above their heads. The burning timber beginning to fall through, they had to give over and then simply could stand by and see the mill burn to the ground, the post falling about 7 o'dock. The grinder left the mill about 8 o'clock on Monday evening when everything was apparently alright." The cause of the fire was not known. Fortunately Mr Bourner was insured. In the 1930s the site of the mill was still easily discernible behind a house called York Lodge and a shop, which was formerly the mill house and baker's shop. Among grinders employed at the mill were Daniel Deopham, T. O. Drury, John Guest, and George Mockford, the latter being the last before she was burnt down. John Guest later became Wlliam Bourner's son-in-law. He became owner of the post mill at Flimwell in 1880, but later returned to Broad Oak having in the meantime acquired the steam mill there. After leaving Broad Oak, Drury worked for a time at Swingate Mill, Guston, near Dover. The mill was a white one with a single-storey wooden roundhouse, and two common and two shuttered sails working two pairs of stones, one peak and one burr. A comparatively late arrival on the Sussex scene, this mill is said to have owed its building to an exceptionally good crop of hops. It was built by Thomas Knight, who was there in 1842. Knight was succeeded in 1858 by his son Henry, whose widow later took it over from him. The last owners were Henry's sons Walter and George Knight. Latterly the miller was George Walker and for 30 years one Fred Meopham was the grinder. At some time the mill ceased to produce flour and the French burr stones were removed. Although the mill appears to have been in very good order when demolished in 1916, certain vital repairs were in fact needed. Their cost was felt to be prohibitive and when a good offer was received for the timbers, the mill was pulled down by the millwright Frederick Neve of Heathfield (whose firm had been responsible for much of the mill's maintenance during its working life). The fall of the mill caused rats, which inhabited the structure, to flee in all directions. The mill was a small white one with a single-storey wooden roundhouse. It had four sweeps each with leading boards and single shutters controlled by elliptical springs. These drove two pairs of stones and a smutter. The windshaft was of iron while the brakewheel, from which the sack hoist was driven, and the tail wheel were wooden. (I am not able to give a Grid Reference at present but according to Simmons' the mill stood one mile and five furlongs north of the church, halfway along a road running between Horsham Road and he village, on the western side'). North Street Mill was offered for sale in 1824, and advertised to to be let in 1830 and 1831. In 1831 the lease included a newly erected house and 20-100 acres of land. Directories of 1834 and 1838 give George Clapson as miller, and the Tithe Map Schedule of 1840 showed him to have been still in occupation in that year. George Wickens had succeeded him by 1851, and was there in 1855 and 1858. An I. Wickens, presumably a relative of George, was listed in 1862. The mill was again advertised to be let in 1863, along with 18 acres of arable and meadow land, and was presumably taken by W. Heath, for he was running it in 1866. By 1870 it was being worked by Thomas Woodhams, whose family remained in harness for the next twenty years or so. Thomas Caleb Woodhams was listed in 1874, Caleb Woodhams in 1878 and Mrs Frances Woodhams in 1882 and 1887. The last miller was Edward Budgen who was listed in 1895; he was said to have last used the mill in 1898, but directories still gave him as miller, not necessarily correctly, in 1899 and 1903. Nor is there absolute certainty regarding the date of the demise of the mill; it was said to have been blown down in 1908, but is on the 1910 6 inch Ordnance Survey map marked as 'disused'. Certainly there is no evidence of its survival after the latter date. Towards the end of its working life the mill was in poor condition and frequent repairs were necessary. It was said that while Luther Pearce, the millwright usually employed there, was tacking pieces on one side, bits used to drop off of the other! The decay continued after the mill ceased work. A photograph of the derelict structure shows it still with four sweeps, but the wooden roundhouse had collapsed exposing the trestle to view1. The mill was a small white one, with a metalled breast and a single storey roundhouse2 It finished work with four spring sweeps, and according to the sale notice of 1824, drove two pairs of stones plus flour dressing machinery. As with many other mills it was latterly in only occasional use, partly due perhaps to as bad condition, and had ceased to produce flour. (1) Photograph in the National Monuments Record, Royal Commission on Historic Monuments, Swindon. Henfield New Mill, as it was called to distinguish it from another, older post mill in the village, was built around 1820. In 1827 the owner was Richard Gates and the tenant miller Robert Stevens. Stevens later succeeded to ownership of the property, the first in a series of tenants to do so. He employed a Mr. Barringer as miller from about 1850. By 1863 Barringer was the owner and his miller was Stephen Gardiner, who himself came into possession a few years later. In 1844, like a number of other Sussex post mills in the mid-nineteenth century, Henfield underwent considerable modification. Patent sails and a fantail were fitted, and whe previously it had two pairs of stones it now became a three-pair mill with two pairs in the breast, underdriven by spur gearing, beside the one in the tail. A number of wooden or largely wooden components, such as the tentering gear, were reworked in iron. In these modifications the mill benefited from the presence locally of the millwright James Neale, later of Neale and Cooper, who carried out the work as an inscription on the massive casting supporting the crown tree testified. 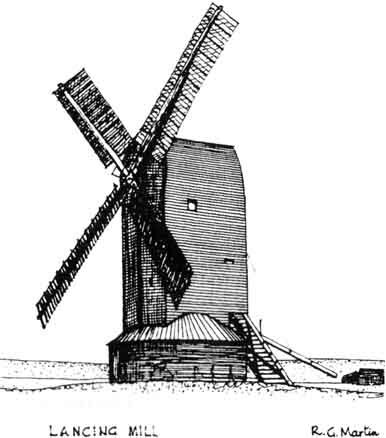 As a result of it Henfield mill can be said along with such as Cross-in-Hand to represent the peak of technical advancement attained by Sussex windmills. After two steam mills were built in the village, the first in c.1860 and the second by 1874, the windmill's working days were numbered. It ceased to grind regularly in 1885, although it was brought back into use for a short period two years later, the miller being Charles Packham who at one time operated Cobb's watermill at Sayers Common, happily still with us today. "On Wednesday 21st October 1943 ... (Henfield mill) was pulled down ... It had been in a bad state of repair for early 20 years ... A fire on Good Friday, 7th April 1950, although quickly extinguished, made the mill's fate even more certain. The gradual falling of the weatherboards lessened the wind resistance and probably gave it a little longer life. It formerly belonged to the late Mr. Tobit and at the last to Mr. C.H. White of Holedean Farm, who in May last advertised the mill for sale, to be demolished; a buyer could not be found, so finally it was advertised to be sold at Steyning ... it failed to sell under the hammer and was sold by private treaty the next day. The work of removing movable parts began almost immediately to make it ready for the final overthrow by its purchaser, Mr. Hatcher of Brighton. At about 11 a.m. on the day a wire rope was attached to a lorry and to the support of the centre post nearest the school which had been weakened by chopping with an axe. After several pulls the mill still proved its strength by remaining firm, causing the rope to break; after a third attempt the support broke away but the mill still remained upright. Next came the turn of the support nearest the church. The same preparation took place; it stubbornly resisted the lorry's efforts to move it but finally it yielded. When it did, all the weight of the centre post rested on the horizontal beams in the form of a cross. These, having been weakened by exposure to the weather, gave way and the mill collapsed to the ground at 11.31 a.m. After nightfall fire again destroyed practically all the woodwork." The fires before and after demolition suggest attempts on the part of the owners to be rid of the structure as soon as possible. Henfield's demise left High Salvington as the only post mill remaining in Sussex west of a line running north-south from the Surrey border to Hove. Fortunately detailed notes of the mill's construction and workings were made by ?? ?linologists such as Denis Saunders and Stanley Freese during visits to it in the 1930s and 1940s. It was a large one and had been extended at the tail by 4 feet 3 inches. The post wa in four quarters; it bore the date 1859 and therefore had probably been replaced in that year. The brick roundhouse appeared to be single-storey but actually had two storeys, the lower one being partly below ground level. There were four double-shuttered patent sails, all of which had gone by the end of the mill's life along with the striking chain wheel and weight box (the latter mounted on the tail of the mill to the right of the door) and most of the fantail assembly. The sails were mounted on an iron windshaft which had four small ribs along its length. The brakewheel was an all-wood clasp-arm, with a large wooden pulley in front of it from which the sack hoist was driven; the tailwheel also appears to have been wooden, although latterly most of it was missing. The wallower, upright shaft and great spur wheel were of iron. Each pair of stones had its own set of governors, driven by belts from the stone spindles. The iron bridge trees were suspended from the crowntree on iron brackets. There were two flour dressers, both driven from the tail wheel via a set of bevel gears. 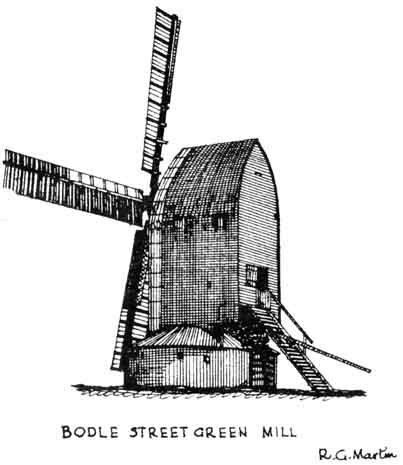 In 1935 Bodle Street Mill was said by Mr. W.H. King, the last man to have worked it, to be 180 years old; however a sale notice of 1807 describes it as newly-erected. By 1810 it was in the occupation of Henry Blackman of Warbleton, who insured it for £400. In 1822, when the mill was owned by Jesse Smith, James Easten was charged with breaking and entering both it and a watermill also belonging to Smith. In July of the following year the mill was again broken into and this time 8 bushels of wheat were stolen. Jesse Smith, or a relative of the same name, was still at the mill in 1858, but J. Golbome had succeeded him by 1862. William Bristow worked it from 1866 until his death in 1891. The last millers were David Frank Baker (1895) and the above-mentioned King (from 1899). The mill ceased grinding in 1924, not long after the breast had been entirely renewed. From then on it rapidly deteriorated. The property was at some stage put on the market, and remained unsold for a long time during which the SPAB was behind unsuccessful efforts to buy the mill for preservation. When it was finally purchased the new owners had no use for the derelict structure, and on 2nd July 1935 it was pulled over by a steam ploughing engine. The mill was a small one with a tarred wooden roundhouse and four double-shuttered s ring sails. The breast was metalled, with the metalling extending a short distance along the sides, and is said also to have been painted black. The rest of the mill was white; this kind of colour scheme is unusual in Sussex, but was at one time common in Essex, where it may be seen today on the restored mill at Mountnessing. There were two pairs of stones, a flour machine and an oat crusher. The sack hoist was driven from the brakewheel cogs via a spur wheel. Visiting the mill in 1929, five years after it had ceased grinding, Gurney Wilson found the interior swept clean with tools arranged ready for use. A half burnt candle was evidence that the last work had been carried out by night. On a timber was carved "Wind strong 4/3/ 1818." This referred to a gale which caused the structure considerable damage. This smock mill is said to have taken its name from Telegraph House, which later became the Mill House. It stood on the north side of the Winchelsea Hastings A259 road, at the western corner of the lane to Brooks Farm. William Cloke was the tenant in 1834 and 1845, and in 1851 he or a relative appear to have been running the mill in conjunction with one Breeds, probably the William Breeds who was running it on his own in 1855. In that year Breeds assigned his estate for the benefit of his creditors. A MrAllen and a MrWeston were in charge in 1858,1862,1870 and 1874. The Mill was put up for sale in 1877, and again in 1883 when it was being let to Edwin Goldsmith who had been in possession the previous year. It was sold again in June the following year by order of the mortgagees, and acquired by Albert Adams for George Morris of Battle who was to run it for the remainder of its active life. During Morris's time the mill was partly overhauled, using materials from the one at Whatlington. It is said to have ceased work in 1903 when two sweeps were blown off. Photographs show that it stood for a time with the other two (1), but they were soon removed and the mill deteriorated until pulled down around 1922. Its foundations were still evident in the 1930s. 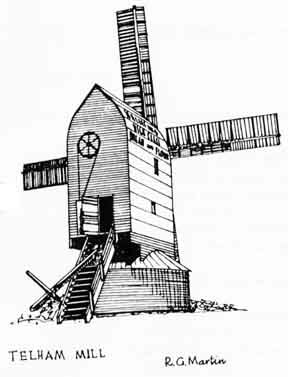 The mill was a white one and of substantial girth, with a squat Kentish-type cap and a distinctive lofty fantail. The patent sweeps, which had fairly wide leading boards, drove three pairs of stones, a flour machine and a smutter and by 1877 auxiliary power was provided by a 10 h.p. steam engine fitted with a force pump. The mill stoodon a brick base which appears to have(2) been enclosed within a wooden "roundel", whose roof served as a stage . (1) Hastings Museum, plus a photocopy supplied to the writer by Mrs Nysted of Winchelsea. (2) Photograph In the National Monuments Record, Swindon. This mill is first heard of in 1774, in which year it was lucky to escape with only slight damage when a severe storm hit the area; 5 barns and a stable nearby were blown down and a number of houses destroyed. In 1778 the miller was John Oliver, who insured it for £300; by 1792 it was John Harmer. In the Defence Schedules of 1801 the mill is stated to be capable of producing 60 bushels of flour every 24 hours. In 1829 it was being worked by a Mr. Meads. At some time between 1824 and 1843 it was moved a short distance to the north­west, to slightly lower ground; probably the original site was regarded as too exposed. In 1845 the mill was rented by George Bushby, who it seems did not actually work it himself, the task being undertaken by a Mr. Mobsby. The latter was an accomplished musician who played the harmonium every Sunday at Coombes church. A piece of timber taken from the mill, which in the 1930s was in the possession of local resident, bore his initials and the date 1849. In about 1860 the mill was partially rebuilt and it was probably then that patent sails were fitted. On George Bushby's death in 1866 his widow Elizabeth, followed by his sons William and Charles, took over the tenancy. William was running the mill on his own in 1878. By 1882 William Bushby had been succeeded by James Cass, who was still there in 1887. Cass gave it up when he became too old to work it after which the owner, Mr. Carr-Lloyd, employed a man to do some occasional grinding until 1900 when the mill finally stopped. After this it stood in a derelict condition, with one sail missing and the weatherboarding in disarray, until pulled down in 1905. Its demolition was probably precipitated by the danger to the local children, for whom it was a favourite haunt and who used the tailpole as a slide. The post remained at the site for some years after the mill had gone. Lancing was a tall-bodied white post mill with four patent sails, whose weight box and striking wheel were located on the side of the superstructure, and a single-storey wooden roundhouse. It appears to have been well-maintained. In the 1930s the earlier site was marked by a mound beside a grass track proceeding eastwards from the top of Mill Lane, and the later one by another, with indentations, on the south side of a track coming up from Coombes Road. The date of construction of this mill remains unknown, but it is shown on Gream's map of 1795. For a number of years it kept company with a post mill situated a little further to the south. H.E.S. Simmons was told that the two were known as the North and South Mills to distinguish them and that at one time a man named Hutchinson worked both. The post mill had disappeared by 1842 according to the Tithe Map of that year. In 1823 the smock mill was occupied by William Cooper Woodhams, who had put it up for sale. For a short period up to December 1841, when their partnership was dissolved, it was rim in conjunction with mills at Playden and Rye by William and James Edmonds. Afterwards James Edmonds operated it on his own for a time. He may have departed by 1845 when one directory gives no miller at Peasmarsh, suggesting the mill was then out of use. It was for sale again in 1849, and for a few years in the 1850s was worked by Thomas Dengate before being taken over by William Bannister Jnr., whose family were to run it for most of the rest of its active life apart from an interval at the end of the century when it was operated by the Bashfords - William in 1890, Albert in 1895 and George in 1899. The Dengates and the Banisters are also associated with the mills at Northiam, the former with that at Mill Corner and the latter with the High Park mill which survived until 1949. Two accidents occurred at the mill during its history. In 1826, a labourer working in the mill yard was struck by one of the sweeps and killed. Forty years later William Banister was more lucky; he was also bit by the sweeps but survived although considerably stunned and suffering severe head injuries. He was able to return to work shortly afterwards, though feeling the effects of his mishap. The mill was a small one, with a single-storey brick base which had a cellar. The cap was a rather squat version of the Kentish type, and there were four spring sweeps mounted on an iron windshaft. Latterly the body of the mill was covered with tarred canvas while the cap was painted white. Though modernised externally at some point, internally the mill appears to have remained relatively unchanged throughout its working life. The gearing was mostly wooden and exhibited one or two quite primitive features. The wallower was of solid construction demonstrating sometimes what may lie beneath the late nineteenth or early twentieth century skin of a mill which began operating in the eighteenth. Two pairs of stones were overdriven and a notice of 1866 advertising the mill to be let mentions a flour machine and a smutter. The brake wheel was of a comparatively rare type, with a central boss like that of a fantail having sockets into which the arms fitted. 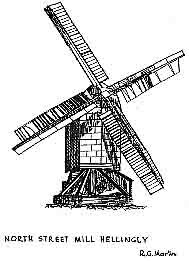 As a final word, the Kentish millwright William Warren claimed that a man who put a new fantail on Peasmarsh mill managed somehow to gear it to turn the mill out of the wind, and had to correct this mistake at his own expense. Rex Wailes, in whose book The English Windmill the anecdote is related, states however "this jibe has been told by many millwrights about their rivals." 3. Photograph loaned by Mr. Clifford Jordan of Rye. This mill is a comparatively recent departure from the Sussex scene and Silverhill smock mill is still fondly remembered by people in the area today. It was built in 1866 by Upfields on the site of a mill destroyed by fire the previous year, which for reasons of space I will not attempt to deal with here. The mill had been extensively improved shortly before its destruction, so the new one was more or less an exact replica of it.1 This large white mill stood on a two-floor brick base which sometime after 1890 was enclosed within a square structure, the roof of which served as a stage.2 In this respect it resembled a number of mills in Kent. Other Kentish features were the shape of the cap, the construction of the fanstage and the lattice-framed dormer windows in the smock. There were four patent sails, the frames of which began furth out from the canister than was usually the case, making for a less aesthetically pleasing appearance. In all other respects though the mill looked very handsome. 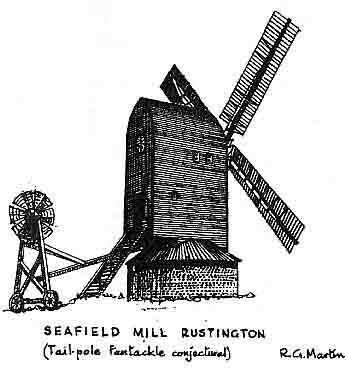 So disappeared the last windmill to stand in the Hastings area and one of the finest mills every built in the county. The only windmill lost to Sussex since has been Winchelsea. destroyed in the 'hurricane' of 1987, unless one counts those like East Wittering and Nyetimber which were gutted of their machinery after having already lost their sails and caps, and thus ceased to be "mills" in any meaningful sense. An industrial estate now covers the site. 1. Hastings & St. Leonards News, [hereafter HASLO], 24 Feb 1865. 2. Photograph of mill reproduced in HASLO 25Feb 1%1. 4. JSP Buckland, writing in HASLO 15 July 1%1. 9. HASLO 4 Feb 1961. 11. Various articles and letters in HASLO, February 1%1. I am indebted to Mr. Brian Purdey of Hastings Central Library for drawing my attention to the relevant newspaper articles. (1) I assume that the article in the Hastings & St. Leonards News dated 24 Feb 1865 gives details of the fire which destroyed the earlier mill on the site. This date is two years earlier than that given by G.M. Powell in Windmills in Sussex, by Peter Hemming in Windmills in Sussex and by M. Brunnarius in The Windmills of Sussex, all admittedly without any source references. As all these authors give 1868 as the year in which the replacement mill was built, has Mr. Blythman any reference that confirms his earlier date of 1866 for this? (2) Mr. Blythman says "This large white smock stood on a two floor brick base which, sometime after 1890, was enclosed within a square structure which served as a stage". Mr. R.G. 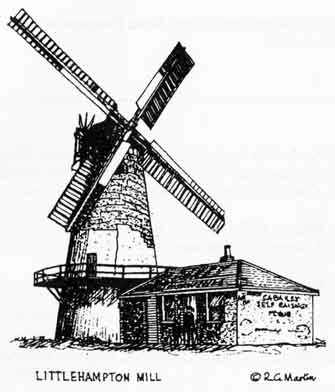 Martin's drawing shows that neither the statement nor the drawing accurately portray Draper's Mill. Examination of a photograph from the August 1934 Sussex County Magazine and of a photograph sold by the Hastings and St. Leonards Observer in about 1960 shows that the "square structure" was built in front of the brick mill base and formed only part of the gallery, the rest being apparently a normal octagonal brick base and gallery. (3) Hemmings says that, in the 1930s, Draper's Mill had three pairs of Burr stones and one pair of Peak stones in use. he also stated that it originally drove five pairs but that a pair of Peaks had been removed at some time. He notes that the sails were 28 ft. long and had 32 shutters although the 1934 photograph in SCM apparently shows 10 bays with three shutters per bay. This last comment suggests that care should be taken when interpreting previously published information. I gather Michael Yates has written to you pointing out some errors in my article on Silverhill Mill on the last Newsletter. I wonder if I might have the opportunity to correct them myself. Firstly, my reasons for deciding on 1866 as the date of the mill's construction (suggested as such in a local history journal). Various authors (Brunnarius, Fowell and Hemming) say 1868 but they do not give a source besides which it seemed unlikely the new mill would have taken three years or so, from the time of its predecessor's destruction by fire in 1865, to build. Most photos of the mill are taken from such an angle as to give the impression that the square structure they show enclosed the whole base; however Michael Yates has two which reveal it to have been an extension on one side only. It is present on a map of 1873 according to Mr Hawksley, and there is no reason to suppose it was not there right from the mill's construction. According to Hemming there was at one time a fifth pair of stones, Peaks, but I was rather dubious about this since smock and tower mills rarely had that many pairs. It is however possible they were on another floor, which makes it more likely. Mr. Hawksley tells me the mill was "jerrybuilt".. This would certainly explain its strikingly rapid deterioration after ceasing work. Mr. Yates' comments about the number of shutters etc. are not I feel strictly relevant to the article as it was not intended to go into such detail. My thanks to the above two members for pointing out these errors and omissions. A windmill stood here in the Middle Ages according to the Victoria County History. The mill with which we are principally concerned was built in about 1801 on "a plot of land containing about 30 rods situate in the south-west part of Whiteweed Furlong in Rodmell', according to Simmons who does not give the source for this information. Gurney Wilson was shown a timber from the demolished mill, which was dated 1745, but this could of course have come from elsewhere. On 16thJune 1810, the owner John Fuller, sold the mill for £700 to John Glazebrook. During a violent storm late in 1825, the crowntree was struck by lightning, which then passed down the main post to the ground, but the mill was not seriously damaged. A year later, in December 1826, John Glazebrook died and was succeeded by his son William who remained at the mill for some 50 years. On 24thJune 1877, William's executors sold the mill to Jacob Verrall, and it remained in the latter's possession until 26th December 1911, when he in turn sold it to a George Skinner who had been his tenant since 1902. 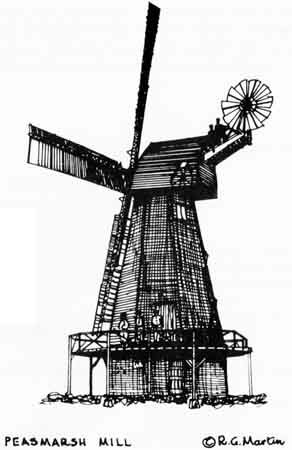 Skinner's predecessor was a man named Westgate, one of whose favourite sayings was " There was a time when a windmill would keep a wife and family". George Skinner and his two sons pulled the mill down on 12th January 1912. It had for some years been in only occasional use, and was in poor condition. After demolition, the machinery and main timber were sold to Messrs. H. and E. Waters of Forest Row. A number of accidents occurred at the mill during its working life. The Sussex Weekly Advertiser of 29.9.1817 reported while working in his father's mill the 14-year old son of Mr. John Glazebrook (presumably William), had fallen through one of the sack trapdoors and broken a thigh, but was thought likely to recover from his injury. On Wednesday 15th January 1871, a boy named James Deadman was playing outside the mill, where his father was miller, when he was struck by one of the sweeps. Fortunately he did not live up to his name, but his right arm was broken and his head severely injured, However the Sussex Advertiser reported that he was progressing favourably. In May 1886, a 9-year old girl named Katie Thorpe was hit by a sweep while searching under the mill for a missing pencil case and suffered a fractured skull. She was taken to the Lewes Infirmary the next day; I have no details as to her fate. The mill was a white one with a wooden roundhouse supported on small brick piers as at Burwash (Rockill Mill), Warbleton (Summerhill Mill) and Heathfield (Sandy Cross Mill). Like many built In the eighteenth or early nineteenth century, it originally has four common sails, which wore later replaced by patents, the striking wheel for which was located on the left side of the tall. The windshaft, brake and taiiwheels were of wood. The sack hoist was driven from a separate wheel mounted on the windshaft, with a universal joint, so that it did not have to be raised to engage it. There were two pairs of stones, a flour machine, a jog scry and a smutter. The bridgetrees in the breast were of iron, while those in the tail were of wood. Originally the mill was entirely of oak, but later a new breast of pitch pine was put in. Latterly most of the millwrighting was done by Medhurst's. The site of the mill is close to the village on a bank well above the road, which becomes the steep and narrow approach to Mill Hill. The spot on which it stood is marked by a clearing. As its name indicates, this mill stood very close to the sea, east of a road leading to it from the church. It is first heard of in 1805, when the owner Thomas Richardson took out a fire insurance policy for it. At one point two brothers named Graves tenanted it from Richardson; one of them, George, was still at the mill in September 1820 when it was being offered for sale, but the advert in the Sussex Weekly Advertiser states that he has been given notice to quit the following year. However the Tithe Map of 1839 gives George Graves as owner, suggesting that he remained at the mill after all and eventually came into possession. It appears to have passed to his family on his death, for William Graves was miller in 1851, 1855 and 1858. In 1865 the mill, then being run by Graves' widow, narrowly escaped destruction when tail winded; the brake broke, three of the sweeps were destroyed and the mill nearly set on fire. This was a blow to Mrs. Graves, who had only recently been bereaved and had a very large family to support. (The report of the incident in the West Sussex Gazette of 8th June gives her name as "Greaves"). At some point in the 1850s Charles Albert Bailey, who also worked the tower mill at Littlehampton, became miller, remaining in the post for forty years or so up to 1908, when a firm named Messrs. Ashby and Son took it over. In 1910 the property was acquired by the Metropolitan Asylums Board and the mill, which had recently ceased work following storm damage, was pulled down and the "Millfield Seaside Home", a childrens' convalescent home, built in its place. The damage appears not to have been too severe (all four sweeps were still on at the time of demolition)1 but it was not repaired due to a slump in the mill's trade. Said to have originally been painted white, Sea Field was a tarred post mill with a single-storey roundhouse, four double-shuttered patent sails with the weight wheel and box on the right side of the tail and a six-bladed fantail mounted on the tailpole. It drove two pairs of stones. An oil painting of the mill, whose current whereabouts 1 do not know, by Maurice Russell of Walberton, provides an interesting example of how artistic licence may mislead researchers. The painting shows wheels on the fan carriage, and one on the tailpole to give it extra support, but there are none on the steps, which are instead provided with a lever for lifting them as in a manually winded post mill. This seems highly unlikely to me, as the weight of the fan carriage and its wheels would make raising the whole assembly an arduous process, and the fan could not work in any case if the steps were levered up. This mill stood close to a railway bridge on the north side of the road to Littlehampton, on a site, which in the 1930s was occupied by nurseries, with the Windmill Inn on the opposite side of the road commemorating its former existence. At one time erroneously thought to have been brought from Angmering, where it was known as the Jerusalem Mill, in 1855. Bridge Mill was built for a family of millers named Humphrey. According to the Tithe Map of 1839, James Humphrey was the owner and Peter Humphrey the miller. Peter is listed in directories up to at least 1862, but by 1866 Mrs. Ann Humphrey, probably his widow, was running it. Another James Humphrey is listed in 1878 and 1882. It was put up for sale in September 1885, and may have been bought by Charles Bailey, who is said to have at one time been running it in conjunction with the Sea Field Mill. The mill ceased work in 1894 and was subsequently demolished; it is believed Mr. Bailey's miller, Lewis Goacher, then moved to Sea Field. Probably Bailey had decided there was insufficient trade for both mills and so transferred the whole of the business to the Sea Field Mill. Like its fellow by the coast, Bridge Mill was a tarred post mill with a roundhouse, four patent sails and a fantail, working two pairs of stones. There was a mill on this site in the sixteenth century. its miller being John Hide. It may have been the same as that used by one Rennalls, who in 1638 was presented for " takinge excessive toll of gristes," a charge which occurs repeatedly against him. 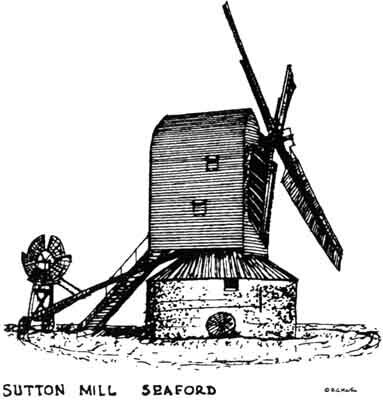 Sutton Mill is thought to have been built around 1773 for William Washer, a sale notice in the Sussex Weekly Advertiser of 26th December 1774 states it to be newly erected. Apparently contradicting this is another sale notice in 1802, according to which the mill was held under a lease which had commenced in 1769. It is possible that the wording is ambiguous. and that the lease was of the property as a whole, the mill itself not being built at the time. Shortly after its erection the mill had become the property of Thomas Washer, but he soon vacated it after which William Washer is again recorded as the owner and occupier until 1779. After this date he appears to have continued as owner only until his death in or shortly before 1802, when the tenant was Richard Bull. It is known that William Bull was working the mill some time during the early nineteenth century; he was presumably a relative of Richard Bull, as was Henry Bull who is recorded there in 1828-9. A directory of 1832-4 gives Charles Osborne as miller and coal merchant, and according to the Tithe Map he was still there in 1839, when the owner was Thomas Allwork. Thomas Chambers worked it in 1845. but by 1851 he had been succeeded by Thomas Allwork. At one time Ade's grinder - the man who actually operated the mill, the "miller" being, as at a good many other Sussex windmills, essentially a foreman - was a man named Jack Osborne. Osborne was very good at his job when he felt so inclined, but was very independent and frequently left his place of employment without obtaining permission or giving prior notification, returning later as unexpectedly as he had left. He was said to have been the only man in the immediate vicinity who understood this type of work (or he would probably have been sacked') Eventually he left Sutton Mill to take up a fresh situation nine miles away at Eastbourne. He set out for his destination and arrived there three weeks later, having meanwhile spent the greater pan of his time in the Tiger Inn at East Dean. Sometime between 1855 and 1860. Ade had the mill reconstructed. raising it and adding a fantail and patent sweeps. He was to continue in occupation until 1887. after which Thomas Sayer used it until it closed in c. 1900. Latterly the mill stood with stocks and the fantail carriage still in position. It was demolished in 1909 after which houses were built on the site obliterating all trace of the structure. During its life the mill saw perhaps more than its fair share of accidents. In 1773 when it had only been standing for a short time, a boy named James Stevens was struck by one of the sweeps and killed. Not long after Thomas Ade took possession of it, a sweep knocked down one of his relatives, fortunately without causing them serious injury; and some time previously had cut a sow in two. These incidents were a contributory factor in his decision to rebuild and raise the mill. "An extraordinary accident by lightning occurred yesterday night at the mill owned by Mr Ade. At the time of the catastrophe there were three persons working in the mill, a man and two boys. and these were struck by electric fluid whilst, singular to say, the mill escaped without injury. One boy named Green. was burnt around the neck, chest, and feet. The other, whose name is Sparkes had both his legs and face very seriously burnt and it is feared that he will lose the sight of one eye They were not found for an hour after the accident. The man escaped without injury but an idea of his danger may be formed from the fact that his watch and watch chain were both melted." "(Concerning) the late accident by lightning at Seaford, we regret to learn that there little hope of recovery in the two lads and that they had been prayed for at Seaford Church on Sunday last. The poor boys did not work at the mill but were driven to it by rain for shelter, and were standing in a draught when struck by electric fluid. The miller also is much burnt in the legs, but is able to go about on crutches." The mill was a white one, with a brick roundhouse. The sweeps were double shuttered. The fan, a very large specimen. had five blades and drove the carriage wheels via two worm screws. At the time it was fitted the millwrights who did the job said there was only one other windmill fantail working on the same principle, in Kent. As reconstructed the mill had two pairs of stones in the breast and one in the tail. Close to the site of the mill, bordering Sutton Road, there still stood in the 1930s the Old Mill House, built by Thomas Ade and consisting of one floor only so as not to take the southerly wind from the mill. I don't know whether it is still in existence. (It is - Editor) The drawing of the mill by Ron Martin is based on a photograph in the Frank Gregory collection. It has been stated that this mill dates from 1747. It has also been referred to as Black Horse Mill as it originally stood close to the inn of that name, about half a mile from the site to which it was later moved. The move to Telham took place about 1800 but the mill that was demolished in 1961 appeared to be of mid to late nineteenth century date. This might suggest that this was not the same mill unless it had been subject to a substantial rebuild some fifty years after its move. "MIRACULOUS ESCAPE — On Thursday last some boys were amusing themselves in the mill plot belonging to Mr. Shaw of Battle, by running between the mill sweeps which were then going with great velocity. One of them, a child of about 4 or 5 years of age, whilst in the act of passing the sweeps had the brim of his hat completely cut from the crown, and wonderful to relate without the smallest injury to his person." In 1834 the miller was Ebenezer Weller but by 1862 he had died and the mill was being worked by his executors. Around 1870 it was taken over by John Fry. Fry was later succeeded by George Edmund Morris, who was there in 1882. George J. Wallis was in charge by 1890, and the firm of Wallis & Co. continued to operate the mill until its closure in 1914 or 15. The windshaft was of iron, with a wooden brake wheel and iron tail wheel. Unusually (but not uniquely) there was room to stand in front of the former. The tail wheel was cast in two parts, with wooden teeth. There were two pairs of stones, both 4 ft 6 in. in diameter. A flour machine was installed while on the spout floor were two wooden mixers, with a common spout which was horizontal and contained a brush for moving the meal along. The sack hoist was driven from the inside face of the brakewheel. 3 F.W. Gregory, in Simmons Collection. 4 Photographs at the Royal Commission on Historic Monuments and in Peter Hemmings Windmills in Sussex (1936). "During the tempest at Heene near Worthing on Wednesday last, some harvesters sought shelter in a windmill (the most dangerous that can be resorted to in these cases) when one of them, a boy, was struck by lightning which singed his hair and rent his clothes, but happily without inflicting any material personal injury." In 1839, according to the Tithe Apportionment, the occupier was William Parker. In 1851 a tithe account gives Jane Lephard (or Leppard as Directories spell the name) as occupier of the mill, mill plot and cottage. Jane had either inherited the mill from her first husband, a miller, or continued to rent it after his death, and by this means it came to be used by her second husband, Edmund Lephard of Heene Farm, from 1853. In 1868 and 1882 Lephard's miller was Henry Ball. The mill was next used by Charles Bolting, who had a bakery at nearby Egremont Place. Botting had died or given up the business by 1893, and the mill then stood derelict until its demolition ten years later, in June 1903. In the 1930s the site of the mill was still evident on the south side of Mill Road, between numbers 33 and 37, just west of Grand Avenue. Heene Mill was a large black post mill with a shallow roundhouse and common sweeps working two pairs of stones. A fine detailed drawing of it by A. Elliott, executed in 1844, could at one time be seen at Worthing Library; I do not know if it is still there. All views presented here are those of the respective authors any do not reflect those of the Society or its officers.